Foxconn 8600GTS-256 PCSTATS Review - Mainstream Gamers Delight? Microsoft Windows Vista requires a hardware upgrade here or there, but a DirectX 10 videocard is almost mandatory if you plan on hitting the next generation games that are coming out later this year. DirectX 10 proves some really astounding visual effects are possible in the gaming environment, and it is married to Vista like.... well you get the idea. With all the hot DirectX 10 titles coming down the pipeline, it's nice to know that there is at least one family of mainstream DirectX10 videocards out, and that you don't have to spend an utter fortune on a Geforce 8800GTX (or the ATI equivalent) just to play at your best. The nVidia Geforce 8600GTS is a welcome respite for the rest of us who cannot justify spending as much on a videocard, as a full PC costs. 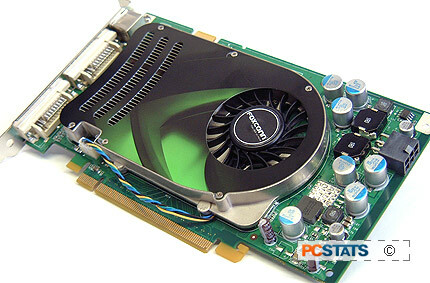 This spring PCSTATS has been witness to an explosion of GeForce 8600GTS videocards coming out, seemingly like blades of grass from every possible vendor you can think of. The heavy push behind the 8600GTS comes with good reason, it's an excellent videocard for the money. As most of the first round 8600GTS cards are based on the reference model from nVidia, manufacturers are pulling out all the stops; game bundles, factory overclocked settings, flashy heatsinks and ultra quiet high efficiency thermal solutions. Foxconn takes a slightly alternative stance, serving up a plain GeForce 8600GTS that kicks out some decent framerates, for a competitive price point. No fuss, no muss. It's the age old tradition of money talks. The Foxconn Geforce 8600GTS-256 retails for $223 CDN ($199 USD, £99 GBP), and comes with nothing more than the basics. The software package is totally unsuited for a gaming card in our opinion, and certainly could have been more inspired. On the whole Foxconn's 8800GTS-256 videocard slides in exactly where we'd expect it to. In some instances it's much faster than the GeForce 7600GT, in others it's only a little faster. On average this Geforce 8600GTS offers a decent performance boost over the previous generation of mainstream PCI Express graphics cards. Heck you can even run two GeForce 8600GTS videocards in SLI to reach GeForce 8800GTS 320MB performance, although this is a more costly route. The Foxconn 8600GTS-256 is a decent overclocker, and in the PCSTATS labs reached a core speed of 763 MHz, with the memory going all the way too 2242 MHz. At higher resolutions there's a decent boost in performance from the overclocking, so keep that in mind. Sure the Foxconn 8600GTS-256 is based entirely on the reference design, but no matter how you slice it the Geforce 8600GTS videocard is a great DirectX 10 mid level gaming solution! Pg 9. — Mainstream Gamers Delight?